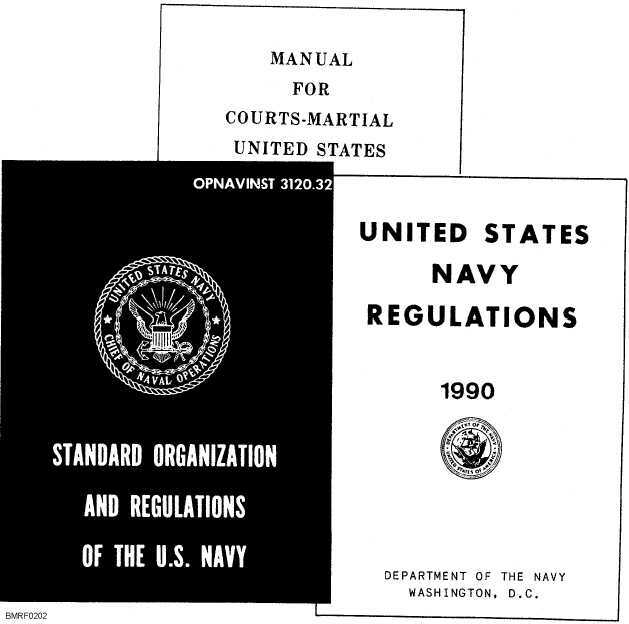 Summaries and Excerpts from Navy Regulations This section lists articles (with a condensation of their text, if appropriate) from United States Navy Regulations, 1990, that all personnel in the Navy should know. This listing serves only as a starting place for you to learn about Navy regulations. You are responsible for learning and obeying all regulations. These regulations are not punitive articles, but laws under which the Navy operates. Many exist for your own protection. Failure to obey any regulation subjects the offender to charges under article 92, UCMJ (Failure to obey an order or a regulation). The first two digits of the article number indicate the chapter of Navy Regs from which the article is taken. If the article is self-explanatory, no further explanation is given; the article will be shown in block quotation exactly as stated in Navy Regs. Articles that are lengthy 2-7 Student Notes: Figure 2-2.Three official sources for basic disciplinary laws.